It's become something of a quest for me to find a curry recipe that tastes like the curry you get from an Indian Takeaway. I'm getting close with the consistency, but can't get the taste right. tomatoes (I've tried fresh, tinned and purée), onion, yoghurt (although this doesn't seem to affect the flavour, so I stopped using it), cumin (tried seeds and ground), mustard seeds, coriander (fresh and ground), ginger (fresh and ground), fenugreek (fresh and ground), garam masala. I'm pretty sure that I'm missing one or two ingredients that restaurants and takeaways use as a matter of course, but I haven't been able to find it. Can anyone point me in the right direction? I didn't realise that they differ, but I'm in the UK - so that's the takeaway I'm referring to. I appreciate curry's vary in taste, but there seems to be an underlying taste to all the tomato based ones. For the purpose of clarity, I'm trying to make a Rogan Josh. Slowly heat the mustard and cumin seeds until the pop, then add the onions and garlic and fry gently until soft. Add the meat and up the heat to cook. After about 10 mins add the other ingredients and leave for an hour or until the tomatoes have turned into sauce. Another thing that I've tried is puréeing the garlic, spices, tomatoes and ginger and adding that after the onions are cooked. This helps with the consistency, but doesn't really affect the taste. The best single answer that I had to this was cream. However, cloves did also make a difference. I still haven't managed to get the takeaway flavour, but thanks for all the suggestions. If the English curry is similar to this, you are missing CREAM! As ever, it depends on the exact recipe. It seems to me that garlic is conspicuously missing from your list of ingredients, though. You didn't put curry in your list, though I assume you don't need to be told that. Rogan Josh was originally a Kashmiri dish. 'Rogan Josh' means 'bubbling fat'. Nowadays 'Rogan Josh' is pretty much any lamb/goat curry with a red gravy. Most of the Rogan Josh I've had in the US & UK isn't anything like what my Kashmiri in laws make. The red color of Rogan Josh comes from a lot of 'Kashmiri mirch', a red chili powder that is rich & flavorful as well as hot - a good substitute for Kashmiri mirch is a mix of 1/2 cayenne pepper plus 1/2 paprika. Ratan Jot (made from red cockscomb flowers) is also used to color Rogan Josh traditionally, but doesn't add much flavor. Tomatoes are NOT used traditionally in Kashmiri Rogan Josh. 1) Fry mutton pieces until brown in ghee in batches in a deep skillet. Set mutton aside. 2) In same ghee fry onion/garlic/ginger paste plus 1 teaspoon salt until most of moisture gone. 3) Add cumin, cloves, cassia, black pepper, and black cardamom to onion mixture, fry for around 2 minutes. 5) Remove pan from heat, add yoghurt mixture 1 TBS at a time and stir in well. 6) Return pan to heat and simmer for 8-10 minutes or until most of liquid from yoghurt is gone. 7) Add 1 cup water to mutton mixture, stir well and simmer until mutton is tender. Salt to taste and serve. Personally i think you should aspire to make one better than the curry house. I think the trick is to use as much fresh spices as possible - make your own Garam Masalla and just use this instead of all your other spices. we toast cumin, coriander, mustard seeds, fennel, one clove, and about 8 cardimon pods. or what ever takes my fancy at the time then grind them in a coffee grinder. Each cook will have his own mix passed down through generations, usually a closely guarded secret. Which is why probably you'll never find that exact flavour. Tamarind. Looking through the various jars of mixes I use, tamarind is in quite a few, and gives it a very bright red colour. Other than that, garam masala, and very very very very reduced onions. An Indian taught me a generic recipe. Fry chilis, then onions, then combine with tomatoes into a base sauce. Fry meat until browned, add the sauce, garam masala, lemon, and mango powder, and simmer for 15 minutes. But, although totally authentic, this is very Indian, not very English. Tasty, but probably lacks what you (and I) are looking for. So, I do all the above, and throw in a jar of Patak's. Sometimes, I use a little cream, sometimes some other marinades before hand, but the base remains as above, and it's pretty Indian. I know in the UK that a lot of restaurants are actually Bangladeshi, so looking for specific recipes there might help. The single tip I've learned that makes curries taste like a takeaway is in the onion, garlic and ginger (chilli optional). These three things should be whizzed to a paste with a touch of salt first. Fry this in ghee after your spices have been dry-toasted in the same pan. Then add the ground, toasted spices to the onion mix. If your dish requires onions as the body of the dish they can be added afterwards, sliced or as required. I can't tell you the flavour difference pureeing these things makes. I also don't completely agree with adding cream. A rogan josh will be more often thickened (and soured) with Greek-style yoghurt. Use a lot of garlic - takeaways use a base curry sauce as the start of every dish, I am sure it uses a lot more garlic than you imagine. Use Ghee as your cooking medium. And use a lot of it. Add dried fenugreek leaves (Methi) towards the end of cooking. Smell them - smell familiar? Smells like the takeaway! It it is taste that is the problem, the issue may well be spicing. What might be missing depends on the type of curry you are trying to make and my best suggestion is to find someone who really knows how to cook Indian food and ask them. One issue that is fairly common is not roasting the spices correctly before cooking the curry so you might want to experiment with that. Marinade the meat in spices before cooking.. I once used up the sauce from a takeaway curry that I handn't finished by frying some chicken and putting in the sauce. It didn't taste like the curry had the night before. Blend onions in a food processor until smooth(ish). Fry this until the onions are no longer bitter and add to the spice mixture you are using to make your curry sauce. It gives the curry the texture you associate with take away currys. Use lemon juice to taste. Add lemon juice near the end of cooking. In addition to 2, and depending on the type of curry you are making fry chopped onions for a long time, until they are golden brown. It will give the curry a lot of flavour. Don't be shy with sugar. The main suggestion that I havent seen mentioned here is that Restaurant Indian uses base sauces. 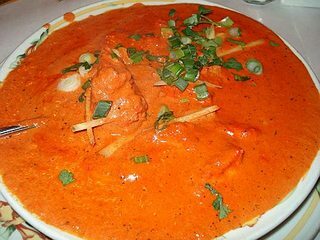 An Indian restaurant will typically have two or three different base sauces - big pots of sauce cooking away all night, which forms the base of a curry. Each curry will use one or more of the base sauces, plus a variety of other ingredients which do not take very long to cook. This allows the restaurant to be able to prepare a curry very quickly, without having every curry already pre-made. It also contributes significantly to that 'restaurant curry' taste. These base sauces are typically made up of large amount of onion, tomato and oil, maybe a couple of veges and a variety of spices for flavour. These are typically cooked so long that all the ingredients disintegrate, or a blender is used to puree the base sauce. While preparing for Indian curry you can season Toor Dal, which gives better taste. Made ahead of time and heated on request. Contain more sugar than usual. Seem to contain tomato paste, judging by the taste. Tend to be cooked for a long time. Contain an unspeakable amount of coconut milk and/or cream. I suggest cooking your curry, however you choose to make it, for about 6 hours. Pat Chapman has written a number of books over the years, containing restaurant curry recipes, and I recommend any one of them. The thing is, restaurant recipes are designed for restaurant scale cooking. An Indian restaurant will typically start the day by preparing a large quantity of fresh garam masala, a big tub of onion puree, a big tub of masala sauce, and so on. Chapman's recipes work this way, each final recipe refers to a recipe for a sauce described earlier in the book, which in turn refers to a recipe for a spice mix. These are difficult things to make well on a smaller scale, and if you try it at home you'll end up with a freezer full of spare sauce etc., which is fine if you intend to make use of it, but makes the first curry very labour intensive. For this reason, I personally don't aspire to cooking a restaurant curry -- I can get one cheaply and easily by having a restaurant make it! I aspire to a curry such as a good Indian cook would prepare for her family on a special occasion. One final thought: Analji Patak, founder of the company that makes jars of curry sauce, has insinuated that more restaurants use her factory-made sauces than you'd imagine. Make of that what you will. A handful of chopped fresh coriander (or cilantro if you're in the US) added at about 5-10 mins before the end of the cooking process is hugely important. It adds a nice pungent aroma and flavour. However the real trick is to find a recipe for a good basic core sauce from which you can create different styles of curry from - kinda like having a good stock. I base mine on this basic curry sauce recipe which I stumbled across a few years back. Most UK Indian Restaurants will start cooking a dish from a simple sauce such as this. I'm also guessing that because it's probably sat around the fridge for most of the day or from the day before, the various spices and herbs will have suffused and made the sauce richer in taste. If I can't get fresh spices then Pateks Curry pastes do a pretty good job as a substitute. Also experiment with small amounts of lemon juice to get that tang you find in more sour dishes such as Patia or Ceylonese Curry (not Korma). Some good tips here and I share your quest to get that authentic taste. I find that takeaway/restaurant curry has a hell of a lot of ghee and garlic in it. Curry also tastes better reheated the next day (caution is required and common sense). Have you tried adding roasted apples (cored)? Also, whizzing up curry with food processor before adding meat or prawns, and adding chopped coriander before serving. I've studied this for years trying to find the answer to that simple question 'how do you replicate that 'Indian restaurant flavour' at home? 1/ Use a base sauce or gravy. All Indian restaurants use one or more 'base sauces or gravies' for the vast majority of their dishes. 2/ Use a very high temperature heat burner to cook your dishes on. Look in an Indian Restaurant and look at the burners they use to cook their dishes on. They are fiercely high temperature burners and the dishes are cooked over a very high heat, a heat I may add that few home gas burners can replicate unless you're lucky enough to have a high temperature wok burner. Not the answer you're looking for? Browse other questions tagged restaurant-mimicry indian-cuisine curry or ask your own question. How can I make this curry given my list of ingredients? Madhur Jaffrey recipes - Indian/traditional names? How do I get the ground spices to mix into my curry? Is there a difference between paneer butter masala, matar paneer, malai kofta gravy? Why did my thai curry have a bitter aftertaste? What's the proper order to add ingredients for an Indian curry?